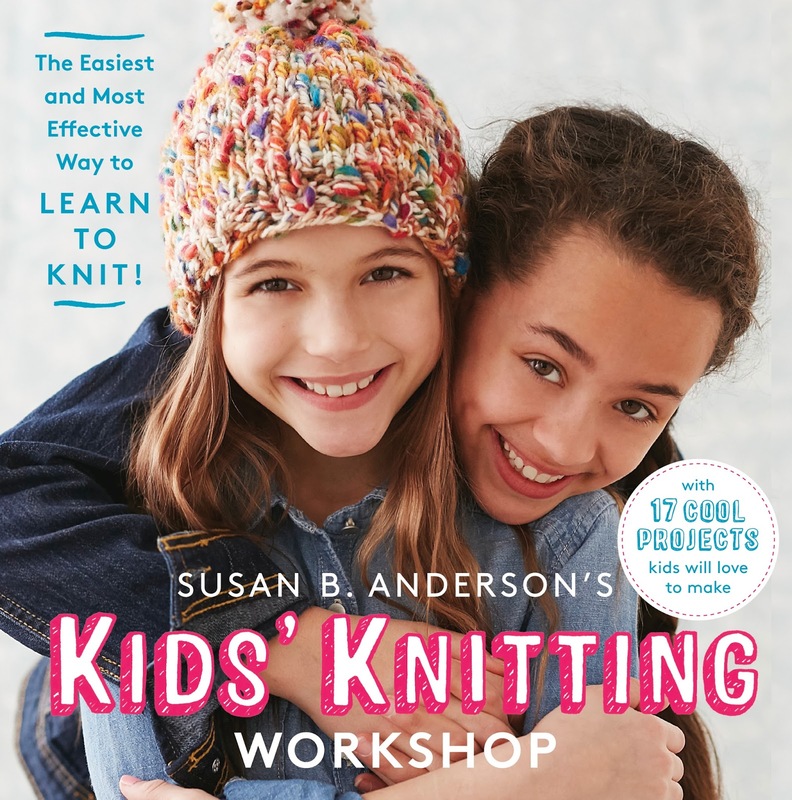 Susan B. Anderson: Susan B. Anderson's Kids' Knitting Workshop ~ Giveaway! 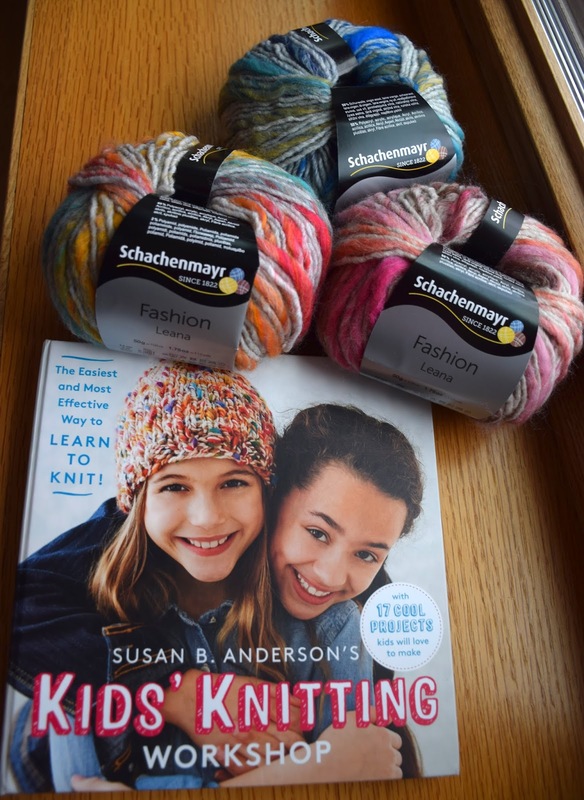 Susan B. Anderson's Kids' Knitting Workshop ~ Giveaway! Be sure to read to the end to find out about a huge giveaway opportunity! Also, early registration for Yarnover 2016 in Minneapolis starts Jan. 9th at 8am! It's on April 23rd and it sells out quick. Here is the LINK for Yarnover. A couple of weeks ago my latest book was published, Susan B. Anderson's Kids' Knitting Workshop. Today I am very excited to share a little bit about it with you. I have been teaching kids to knit for many years now. I have taught kids in small groups, individually, and through my daughters' Girl Scout Troops and in a lot of different settings. Do any of you remember these photos from TC's Girl Scout Troop's knitting lessons at my house in 2009? If you want to see and read more about how I taught the Girl Scouts to knit Click Right Here! First of all, this book was a labor of love on two topics that are near and dear to my heart, kids and knitting. The book is geared to reach 8-12 year olds but it is a good book for any age person, including adults, wanting to learn how to knit. The book takes you step-by-step through the basics of knitting in the round as the ideal place to start, and lesson-by-lesson techniques are added through tutorials and projects. If the beginning knitter works through the book she/he will come away with a great base of knowledge about knitting, and could tackle any number of projects out there in the world of patterns. It's exciting to think about. Included in the book are 17 do-able, snappy projects that are fun and appealing for a wide age-range but will also hold young attention spans. Most of the projects are fairly quick and are knit on needles ranging from a US size 7 to a US size 13 or so. There are a couple of slightly bigger projects including a tube scarf and a pillow. Click here to find out more and to see all of the projects in Kids' Knitting Workshop on Ravelry! The photography, by New York City-based photographer Lauren Volo, is fun and bright, and the models are adorable. One aspect of the book that I am especially impressed by is the illustrated tutorials by Alison Kolesar. Alison is a remarkable artist. I would provide a photo of my hands doing a certain technique and then Alison would create the illustrations to show exactly what I intended. It was a really fun and successful aspect of the book. Both of these creative women were wonderful and added so much to the pages of the book. I have made a couple of supplementary book tutorial videos on my YouTube. One video is on how to do magic loop and the other is on how to use double-pointed needles. Click here to visit my YouTube Channel, SusanBAnderson. Click here for more information on the Stripy Legwarmers on Ravelry! 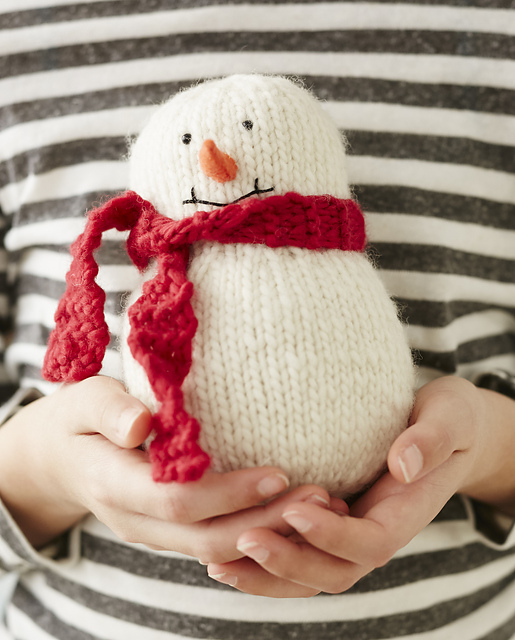 Click here for more information on the Snowman on Ravelry! Click here for more information on the Cowl on Ravelry! Click here for more information on Hat with a Rib on Ravelry! Click here for more information on the Fox Pillow on Ravelry! Click here for more information on the Owl & Kitten Toys on Ravelry! Click here for more information on Mason Jar Cozies! I am so excited to be able to offer you all a gigantic giveaway today to celebrate! I am offering 10 winners each a prize package. Each winner will receive a signed copy of my book along with 3 skeins of Schachenmayr Leana yarn! Along with the book you will get one skein each of three different colorways (rainbow, blues, pinks and purple all mixed with gray), perfect for many of the projects in the book. Thank you to Artisan Books and to Schachenmayr for the prize packages. Please leave one comment on this blog post to enter to win. The comment must include either your Ravelry username or your email address so we can get in touch if you win. Tell me about who you might teach to knit or your favorite project if you'd like. I'd love to hear about it. Please click on the "Publish" button only one time when you are leaving a comment. There is a delay before your comment will appear. The Mason-Dixon Knitting blog/website is reviewing Kids' Knitting Workshop soon along with a giveaway so be sure to check them out, too! And don't forget that StevenBe's has Kids' Knitting Workshop kits (including a bag, yarn, needles, the book and a furry pom-pom) all set to go if you want a gift set for a new knitter. I'll be back soon with the 10 winners! What a great book! I love the concept and I love the reviews that I've heard about it. I would love to help my neighbor across the street learn to knit. She has been very depressed and I think this would really help her but I haven't really known how to start teaching her. This book would be our "textbook" to work together on. How fabulous! My two boys have been asking to learn to knit and they would love this! THanks so much for writing this book! I love that you've done a book on teaching kids to knit. I'd love to use this book with my own girls, as well as the kids who come into the local Saturday Farmer's Market that a friend runs. Those kids see us knitting at the Market and are always curious. I would teach interested co-workers how to knit on our lunch break. It was very rewarding and gratifying to see their satisfaction as they progressed from lumpy scarves to beautiful shawls, etc. Oh, what fun! My daughter and daughter-in-law are both learning to knit and I couldn't be happier. I can help them a bit but Your tips from this book are invaluable! I'm karenswb on rav. I'd love to win a copy of this beautiful book! I am teaching my nine year old neighbor to knit and would LOVE a book to share with her! We are having the best time and she is learning new skills every "lesson!" I can't wait to get this! I have 2 aspiring and 1 newbie knitter to gift this to! What cute projects, I would love to make some of these myself! artsyalycia on Ravelry. Fantastic book, adore your video podcast and the Knitmore girls! When I found out I was pregnant with a boy, I told me husband, "I'm still teaching him how to knit!" He has the beginnings of interest at age 3 but I expect talent to emerge in a few years. Congrats on the book, it sounds fantastic! I would love to share this book with my 8 year old cousin. I taught her how to crochet and she is eager to try out knitting and reading patterns. So generous! I'd love to teach my daughter and her cousins to knit the leg warmers. So cute! Hi Susan! I love the pics I am seeing, this book will be a lot of fun! I FINALLY got some beautiful yarn for my retreat shawl, can't wait to get it started! Love the book. Love the idea of teaching kids to knit! I'm looking forward to my grandchildren being old enough to learn to knit! (that is who I'd teach :)) Love following you and seeing all the beautiful things that you create!! I taught my daughter how to knit not too long ago. She would love doing the fox pillow! I'd like to make the cozies for my craft room. I'm RobinBarraud on ravelry. Thank you for the opportunity. I love the binding on this book. Thanks for the giveaway. I love the style and energy of this book. My daughter knows how to knit but never finished more than a Barbie scarf. (2roes) I would love to revisit knitting with her and I think she would love some of these projects. Susan, I've begun to teach my now 8 yr old granddaughter how to knit and this book would be the best gift for us to share. I never was able to sit her mother down to learn to knit, but she does crochet, so she would love it, too. I'm also planning, next year, to help her and her Girl Scout troup learn to knit. This year she is a brownie and there's no badge to earn, but when she bridges up to junior's there apparently is a badge to look forward to. I was a GS, also, so I know how much that means. Thank you for offering this to so many. I'm keeping my fingers crossed. What a Fabulous book !!!!! I have many friends who want to learn to knit ..... this is perfect !!!! I would love to share this book with my 11 year old daughter. She has tried knitting in the past but I think she would love the kitten toy and the fox pillow in this book. Let's get the next generation of knitters started!! My niece was finger-knitting in her first-grade class and was excitedly showing off to me at my family's New Year gathering. I told her that I'd love to teach her knitting with needles. She was very excited. I had heard abput your book on both Knitting Pipeline and the Knitmore Girls, and had been planning to buy it for her. My Ravelry username is bananagranola. Thanks! I just taught my granddaughters to knit a scarf.They are doing well.I would like to teach them the knitted leg warmers above. Thanks for a chance. My daughters (10 and 7) keep asking me to teach them how to knit. I have no idea where to start! I need a copy! If I win this. I will make the cute snowman, but then pass this book on to a local girls club knitting group where it will be most appreciated. Hi - I would love this book to teach my daughter to knit. The patterns look fun! Both my kids are in the prime learn to knit stage. They have learned a bit but would benefit from a book with appropriate projects instead of just garter doll blankets. I bought this wonderful book for my goddaughter, but would treasure a signed copy! I taught my daughter to knit when she was 6 based on your posts about teaching the Girl Scouts. She put it down for a while, but now she is almost 8 and is starting up again. We just moved to the purl stitch and casting on. I would love to start her on one of the projects from your book! Your Itty Bitty Hats was my first knitting book, and the reason that hats are my favorite thing to knit. I'm stripespolkadots on Ravelry. I would love to use this book with my 11 year old niece. We have been meaning to sit down so she can learn to knit! 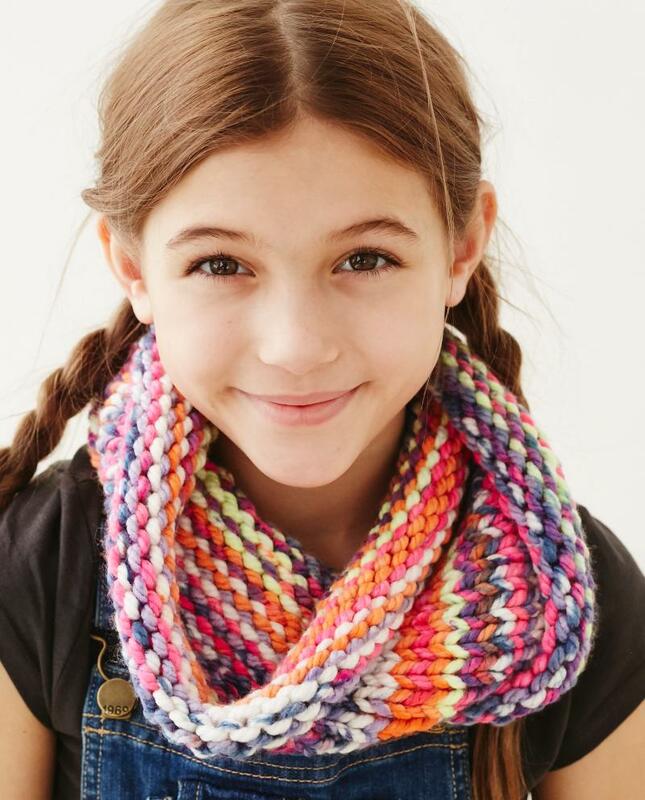 I'm teaching my daughter to knit and these look like very accessible projects to start with! My Ravelry name is HattiesPurls. Love your new book! Not just for kids! I've been eyeing your book as my daughter has begun showing an interest in knitting. We got her a loom for Christmas and she absolutely loves it. She would love this book and the yarn you are giving away! Thanks, Susan! Oh my gosh! Everything about this is wonderful and exciting. The adorable fox pillow would be first on my list. Thanks for sharing! 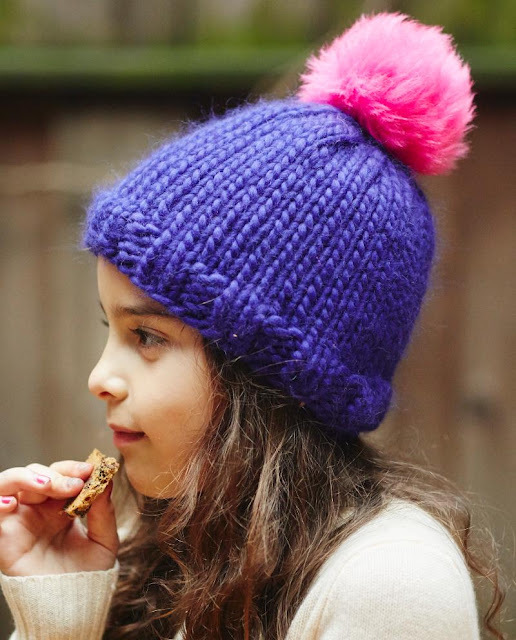 I love the photos of the girl scout knitting. What a perfect craft idea that will give the girls a skill to use their whole lives! Thanks for encouraging a new generation of knitters! Pat at npmofjeld@comcast.net, Mofjeld on Ravelry. My niece has just started to learn to knit. I think this would be an excellent book to keep her excitement up! 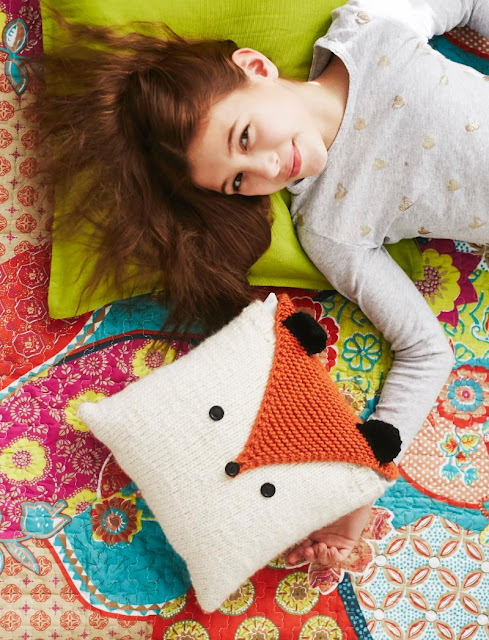 I adore all of the patterns, but that fox pillow is calling to me. It's so cute! I would love to teach my 5 year old daughter to knit. She is very artsy and creative- she loves to draw and color. I recently taught her how to finger knit and she made a cute fashion scarf/necklace. I love the leg warmers I would teach my niece when she gets a little bit older. Thanks Susan and congrats! Would love to teach my daughter to knit and would love the help of this book to do it! Oh how fun! I first learned to knit as a "Girl Guide". I believe this is a Canadian/UK organization. I didn't really fall in love with the craft until much later, but I remember those early stitches and unfinished scarves very fondly. Learning to do something useful and satisfying with your hands is such a wonderful gift to give a young person. I'm alicats on Ravelry and Mycolourwheelhouse on Instagram. I would love to win this give-away! I have three grand girls aged 5, 7, and 10. They have all shown an interest in knitting, and I have tried loom knitting with each of them. Would be so great to benefit from your instructional techniques! The older two each have Princess and the Pea sets from your previous books.. Thanks for all your inspiration! I would love to teach my 9 year old daughter to knit and would really appreciate the help of this book to to that. I also taught my 8yos brownie troop to knit. I cast on 16 tiny skeins to take with me but still the hour and a half wasn't nearly enough time and I'd love to work with them more. I would love to share this book with my daughter. Interesting, useful projects, a great learning tool. Then she can knit me a fabulous Susan B Anderson shawl for my birthday! I have granddaughters who are 8 and 11 that are ready to learn to knit. This would be a fun book for all of us! My granddaughter has asked me to teach her to knit..this would be perfect! Your other books have been wonderful, I know this 1 will be, too. I love your books so much! Can't wait to tuck this book away to teach my love of knitting to my grandchildren. You are my knitting inspiration Susan! I just started teaching my daughter to knit and sew. Your new book would be a perfect book for inspiration! rav id = jckwcs Great give away! I am looking forward to teaching my granddaughter how to knit. She is 7 years old and very artistic. She loves creating things! Since knitting is a Hugh part of my life I think this will be something very special to pass on to her. This will be a wonderful book to share with her. This looks like a great book--I'd love to have it to give to my great-niece, who's 8. Such cute projects, too! I particularly like the fox pillow. First I would show this book to all my knitting friends with kids and grandkids. Then I'd teach my friend , Darla, to knit. She is 10 years old. Would love to win this for my 4 granddaughters! I love your patterns and this newest book is wonderful. 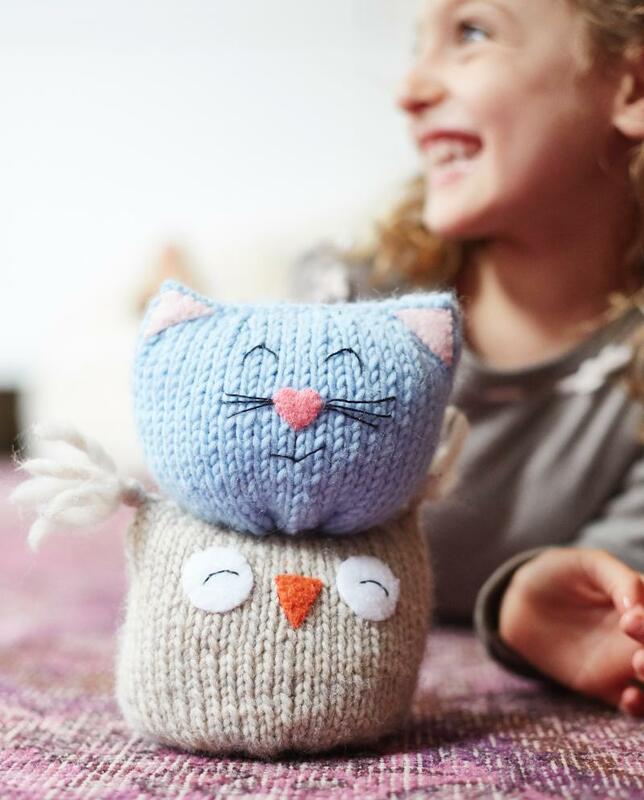 I saw the Snowman first and loved it, but then I saw the cat and owl which is adorable I don't have any grand children, but I do have a darling 2 year old niece who is getting a new little brother this month I knit for them. Good luck with the book sales! It's a fabulous resource for teaching young ones! I already bought two copies, so you don't have to include me in the giveaway. Rhiannon got the kit from Steven B for Christmas and I have a copy to use with the younger grandgirls. I have two kids and the older one is almost ready to learn to knit! This book would be a great present for him. Hi. I'm shamekaknits on Ravelry and I took your class at Vogue Knitting last year. You are such a great teacher and such an inspiration. I would love to win this to teach my little cousins to knit. They are just begging to get their hands on some needles. This would be perfect. I'm hoping to teach my niece Corianne how to knit soon. I plan to buy this book for her regardless. It's my birthday today so it would be a nice present too. I'm melcauble on Ravelry. What an awesome book! I would love to win this. I am currently trying to teach my 9 yr old daughter to knit and I think this would be the perfect companion for that. Would love your book that for sure. But good luck to all who has entered! I would love to teach my 8-year-old how to knit! I'm loving hearing about your new book through the reviews. It sounds perfect, not just for teaching children, but also for anyone new to knitting. I'm already recommending your book to my local library since they have a Saturday morning knitting time open to all ages from children through adults. I'd love to try it with the Girl Scout troop that two friends lead. It would also be perfect for some adults who know nothing about knitting but have shown an interest in joining our knitting group at church. I would love to teach my niece Matilda to knit the snowman so even in Dubai she can have a bit of winter snow! Great giveaway! I have two girls that would love this! I need this for my boys both have played with knitting and a little crochet. We went over basic stitches and they both have enjoyed it. I think having their own books would help in the process. The youngest who is 4 managed to do several knit stitches by himself. 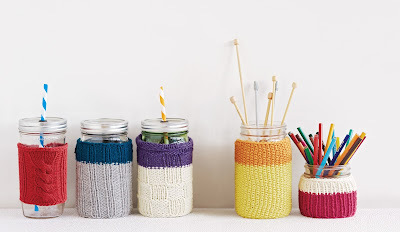 I love the jar cozies! My 11 year old son has attempted to knit several times and I think he would be able to complete those. I remember when you did the girlscout event. I referenced your post when I taught a group of women at my church. I love to teach it in the round. I would love this book to help continue teaching a sweet 8 yr old girl that my 8 yr old son is friends with. Congratulations on your new book! I totally remember that post when you were teaching TC's Girl Scout troop to knit. My 10 year old daughter would love this book! Thank you for the chance to win. I think I'd use the hook to teach my kids. My 4 yo son is kind of interested but his 2.5 yo sister is obsessed with trying to knit although I think she'll need a little more time before she'll be ready to learn properly. The baby boy is only 3 months so he really has a lot more growing to do before I teach him ;). What a wonderful giveaway! I'd love to teach my son and his friends. Love this book! I will be using it to teach my youngest daughter to knit and some co-workers too! Thanks for all you do for our knitting world! I told my daughter-in-law about your book (which I own and love) and that I'm anxious to someday teach my granddaughter to knit, but Lily is only 3, so she'll have to wait awhile. But my daughter-in-law immediately said, "Teach me!" How fun is that? My boy is turning 8 at the end of February, and this would be a perfect way to show him how to start one of my favorite hobbies! I have a friends daughter who wants to learn how to knit newborn hats for the pediatric ward of a local hospital. Would love to win this book. Can see some new knitting in my future. I'd love to have your book to teach my cousins (and my dad, ha!) how to knit. Thanks for the giveaway! This would be so helpful teaching my 9yo daughter and 7yo son to knit! They've asked me to teach them but I have not been successful. I'm excited about the book! This is an amazing giveaway! Would love to use the book to teach my 6yo to knit! Very lovely book!!! I would definately use it to teach my 7 year old daughter. She is showing interest in learning how to knit!! This is an amazing giveaway. Congratulations on your new book! I would love to use it to teach my 8 and 10 year old nieces how to knit. Thanks for the chance to win! Beautiful book. All of the reviews I have seen have been great. I would love to add this one to my collection. Looks like a great book for kids of any age! I know just who I'd teach with this book! My friend's daughter is nine and SO enthusiastic about crafts! This is a beautiful book. All the reviews I have seen have been very positive. I would love to add this to my collection. I have five granddaughters and the two 7 year olds have been asking me to teach them to knit. This would be a great resource. I have heard several review of your book on podcasts and it sounds amazing. I wish i lived closer so i could sign up for your workshop...Washington state is a little far. I have 3 grand daughters who I knit for ( 5 yr old and 3 yr old twins) and the 5 yr old keeps asking me about my knitting whenever I'm there and when will I teach her. I'm excited that she wants to learn that not sure what is a good age to start. Would love this for help teaching my nine year old granddaughter to knit. I had a great time knitting your sweater patterns for my heifer international flock! Thanks so much! Janicemary on rav. theresehoven@gmail.com I've already taught my little 7year old sister to knit the basic knit stitch, but it would be so cool to teach her from your book and seeing her making more projects then just scarves! How very exciting for you to have another book published! Also, I love seeing your YouTube videos! So inspirational! This would be a great book to teach knitting at our homeschool co-op! I'm knitspinner69 on ravelry. My boys would love this! They have been begging me to teach them to knit. This book is so cute! I would love to teach my nephew to knit. Very nice! Pick me, please! This would be awesome for my daughter and grandson to learn together. Susan, I love your books...so creative and well done. I have a young friend at church that appreciates hand-made items. She made me a loop woven potholder, and I gave a her a little mitten knit with sock yarn...so I know she would love the book and the chance to learn how to knit. That cowl looks like fun. (I usually use a hat as a first time project for teaching adult knitters, but this cowl is a great idea too). I would love to receive this wonderful book to teach my four nieces to knit. Two of them just recently lost their mother in October 2015 due to an aggressive brain tumor. To help them cope, I think teaching them to knit will be very therapeutic for them to concentrate on an activity. Hi; I think the Snowman might be my favorite right now. So many cute projects. I hope to teach my granddaughter someday , but it will be a few years. I am happy to teach anyone that is interested. I like knitting for my granddaughters and would love teaching my grands. OK - I am positively drooling... I haven't won any of your giveaways... YET....... PLEASE - let THIS be THE ONE! I hoping to get my sons to try knitting. My youngest has done some finger knitting. I would to have either if my kids Learn. I gave a copy to my 8 year old granddaughter for Christmas. She loved the leg warmers and the bracelets...and will knit a hat for her friend Rosie's new baby sister, Hazel. We will share a copy with Gretchen's friend, Meredith, who also wants to knit. Thanks to all for the generous give-away. My son's girlfriend is wanting to learn how to knit. This would be great for her. I love your patterns! I love that giant Pom Pom! I have a 10 year old grandson who wants to learn to knit. This book would be a big help to teach him. I have a bunch of nieces who are dying to learn to knit. This looks awesome. My niece was just seven yesterday and keeps asking me tot teach her to knit. I think this would be just the thing. Thanks for another great giveaway opportunity. Thank you for this book. Love your patterns and can't wait to share more knitting with my granddaughters (I only have granddaughters)! Sorry if I'm accidentally posting this twice. I have a bunch of Nieces who all want to learn to knit. This book is awesome. I love knitting hats for my son! And for myself...cowls! I would love to teach my niece. She got a finger knitting set for Christmas and I think she'd also like the real thing! LOVE LOVE LOVE your books and work!! I'm a teacher. I bring my current project with me for a little "ohm" during my lunch break. Students are always asking about it and want to learn to knit. This book would be a great resource! I'd love to teach my nieces to knit, if I could get them to sit still long enough! I've heard so many great things about this book! I would love a copy - all the projects are so cute and I love the teaching method! I would love to sit down and teach my granddaughter to knit. She's just turned 13 and boys and sports are her interests. I'd love to have a few quiet afternoons where we could talk and laugh and just relax with each other. I think she'd like this book. The patterns look very appealing! (missmoxieatmacdotcom) Thanks! I would love to teach my niece to knit! She has been into everything "pioneer" lately and she's very talented! She learned to finger knit and this would be perfect for her :) melissabudd@gmail.com thanks so much for the opportunity! What a great giveaway! I would love to win this one. Both my sons (10 and 7) can do basic knit stitches and I'd love something to inspire them and my nieces! I will teach anyone who has the desire to learn. Exciting! I'd really love to teach my daughters to knit, but at the moment neither appear to be too interested. However, at my 16 year old daughter's hockey game last night, I did teach a younger sister of a teammate how to cast on and knit, she's working on her first dishcloth. And at 12 years old she is super excited (but maybe not as much as I was!). I would love to teach my grand daughters how to knit! I love your books! I have been following your blog for a while; I love your ideas on life,family and knitting. I have a few adult girlfriends who are interested in knitting and I think your book would be very helpful. I am a third generation knitter, my birthday is Oct. 5, and I have five fantastic children! Absolutely love the Fox Pillow. I would love to teach my cousin's daughter how to knit this project. Live your designs. I would love to win this for my daughter and me! A beautiful book! Thank you. This is fabulous. I spent New Years with my brother in law and his family and I was knitting and my 12 year old niece asked me to teach. I think I screeched a little as she was saying it. NO ONE else knits in my family besides my mother and me! I jumped up and we drove down to the LYS and she is successfully on her way to completing her first knit scarf! I am so proud....when I heard about this book on the Knitmore girls podcast I had to have it right then but I only buy ebooks so I would love to win a print copy for my niece! Thanks for writing such a fabulous book!! Hello Susan, Thanks for this opportunity! I tried to teach my daughter how to knit and somehow failed at this despite being a teacher. Over the years, family, friends and coworkers have asked me to teach them, but I've always declined as I thought I didn't have the knack for it. I'm confident your book will give me the tools to help others become successful knitters. I bet I can even help my daughter learn to knit - especially with such gorgeous yarn! I taught my 7-year old grandson to knit. He did a small swatch and slept with it. That was the end of the interest, but I'll bet your book would inspire him. I am farflegirl on Ravelry. Than you! This would be awsome to help teach my 8 yo daughter. I already know what I'm getting my niece for Christmas next year! Caroline and I will be knitting the fox pillow but first the adorable, simple, classic hat in the round. I love knitting in the round and I was taught by you! Itty Bitty Hats was the first knitting book I owned. Thank you, Susan! I tried to teach my nephew to knit but I think he was too young....I would love to try again now that he is older and getting into color and fashion. I'm di327 on Ravelry....and can't wait to take your class in March in Sarasota FL....YEAH!!! How much fun is this. I have taught many youngsters to knit but never had such exciting resources as this book. I will have to get one for my granddaughter. Oh my gosh, this book looks amazing! I have the rest of your books and would love to add this to our household. I have a 15yodd who is just learning to knit, and would love to win these, and a 13yods who is curious. Thanks! I can't wait for my kids to show an interest in knitting. I know that when they do, they will ask for your patterns! Thanks for the chance to add another signed item to my treasured collection! I love your designs..my adult granddaughter just had her first child ( my first great grand)and she wants to learn to knit ...I got her needles, yarn and one of your patterns to learn. This book would be great! I can always add a(nother) autographed copy of a Susan book to my stash :) And yarn? Of course! Such a generous give away! I would love to teach my sister or boyfriend to knit. I would like to teach an adult to knit--in fact, someone who just asked me about knitting today! He's a librarian, and just think of all the publicity he'd give for your book, because of course he will love it! RAV name: KnitsWithSnicks. Perfect for my niece's daughter. Hi Susan - I purchased your book intending to give it to my great niece for her 8th birthday which is next month. After reading it from cover to cover I might just have to buy a second copy ( if I don't win one in your contest) because I want to keep it for myself. I love how you start with teaching to knit on a circular needle. I never thought of teaching someone that way before reading your book. Also, I love how you include both the continental-style and the English-style of knitting. The projects are so well thought out for the intended age group. My niece will love them. Actually, I love the snowman. I plan to make one this month and add Kriste's stocking hat from her pattern on Ravelry. My sister-in-law who is new to knitting, looked through your book while she was at my house recently and found it extremely helpful. She plans to buy a copy for herself - so it really is helpful for new knitter's of ANY age. Oh, and I loved looking back at your blog from 2009. The "circle group" of Girl Scouts was so funny. And the hats they made for charity were so professional looking. Thanks for that.